Blurb: "Full-bodied black tea designed for Australia". Website description because the above is deliberately vague: a blend of "the slightly smoky Russian Caravan with the full bodied Irish Breakfast and then added the light Ceylon Orange Pekoe". Anyway, to the tea at hand. As advertised, this Australian Afternoon Tea is certainly a full-flavour strength tea. The Irish Breakfast predominates, but the after-taste shows the smokiness of Russian Caravan (which has grown on me still further since my review last year - I now drink have a tin of the loose-leaf version at work & often make myself a small pot of it mid-morning). Between those two flavours, the Ceylon Orange Pekoe gets a little lost (as it is wont to do even when it's the only flavour in the tea). It actually all works together quite well - the Russian Caravan is distinct enough to temper the Irish Breakfast while still allowing the latter's strength to be the tea's distinguishing flavour. It's a warm-ish afternoon as I drink my cup & type this, and I can vouch that it suits the setting well. Its slightly fuller taste stands it well against some of Twinings' smoother flavours (like the Prince of Wales or the Pekoe itself), but the inclusion of the Russian Caravan does give it a bit of softness compared to an unadulterated Irish or English Breakfast. It also has a bit more of an obvious flavour when compared to something like their Traditional Afternoon Tea, which I sometimes feel just tastes like Strong Tea without any more notable flavour than that. 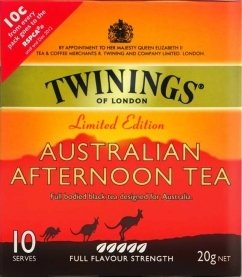 All that said, I suspect there will not be a huge public outcry should Twinings remove the Australian Afternoon Tea from the market (the box indicates it's a 'Limited Edition'). While it's quite an enjoyable drink, I doubt it is memorable enough to become anyone's new favourite blend. I'll certainly drink the rest of my packet with pleasure - and probably buy some more when it's done - but, after a few cups over a couple of days, it hasn't really made an impression stronger than 'oh, that's quite nice' on me yet. Nonetheless, the Australian Afternoon Tea is certainly worth a try if you enjoy full-flavoured black teas or drinks that make you feel vaguely nationalistic. ** Note to Kerri-Anne & John Kennerley: you don't need to put Earl Grey & Lady Grey into the same blend. Note to John Williamson: if you put Lapsang Souchong into a tea blend, you should also remember to include toothpaste to get the taste out again. And Layne Beachley: really? Why bother putting three light teas together and then adding Irish Breakfast? That's all anyone will be able to taste. You may as well just have your 'special blend' include Irish Breakfast and water. I enjoy a cup of Lapsang Souchong so would have liked to try John Williamsons' blend. I think he was trying to get the essence of swagman. We would love you to review our tea, please email me at hello@elruh.com if your interested. Can you tell me where you buy the Australian aftternoon tea loose leaf please? You may doubt the Aussie Afternoon Tea is memorable enough to become anyone's new favourite blend, but I sit here in Texas, having a cup, and it is absolutely my favourite tea blend. I know of at least two other USAmericans who feel the same, and I only wish Twinings would bring this product to market here in the States (especially since I'm getting down to my last few bags of it). It's changed my life in its little way, significantly lessening my coffee intake, replacing it with tea. Just had to put in a vote from someone who loves the stuff! I'm sitting in Singapore, sipping this blend, and loving it too! Similar. I am Australian, but have lived in Japan for a long time and more a coffee drinker. Someone sent me a pack of 20 tea bags of this and I quickly became hooked. At first I thought it was probably not all that remarkable, but after the pack was finished I started searching for a suitable replacement. So far nothing has quite hit the spot like this malty and vaguely smoky little number, which is just an immensely satisfying cuppa. I'm visiting Australia and just bought this tea for the first time and I LOVED it! I have converted from coffee to this tea for my afternoons and it is wonderful. i don't care for coffee anymore, and i use to be a huge coffee drinker. Do you want to buy lapsang souchong loose tea in Canada? Then visit Teamatica.